Wet at the End of the Ridge? A weak series of systems will undercut the ridge this weekend bringing a shot at some light snowfall for the northern half of the Sierra, better air quality to valley locations and dropping temperatures closer to normal. A major pattern shift looms on the horizon. The typical January, or more aptly named Juneuary, ridge that has brought bitter cold to the eastern 2/3 of the country and well above average temps for us will be undercut by a series of weak waves starting tomorrow. The first wave will bring some high clouds to the region tomorrow morning and a possible stray snow shower to the Tahoe area by evening. Attention then turns to Sunday night as the next wave begins to approach the Northern Sierra. This system bears watching as the latest runs of the GFS (the American, Global Forecast System) have come in stronger and wetter. If this morning run verifies then Lake Tahoe and points northward could see a couple of inches of snow by Monday evening. 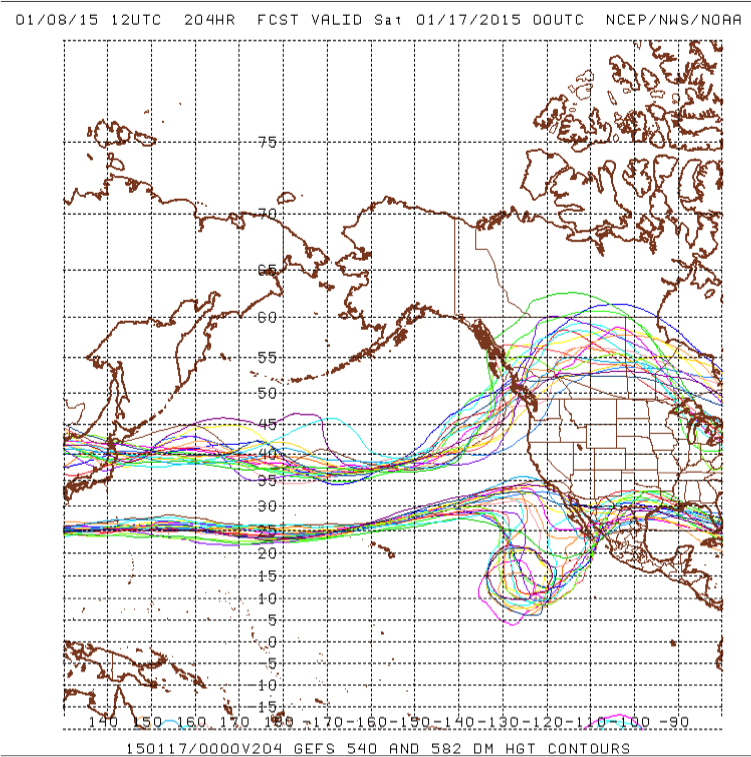 Models continue to come into better agreement on a major pattern shift occurring towards the latter half of next week. As can be seen in Fig. 1, all of the ensemble members of the GEFS (the American, Global Ensemble Forecast System) show the ridge weakening and moving east between now and next Friday. The European model is also coming into line with the GEFS, further increasing the confidence of a pattern change arriving towards the end of next week. 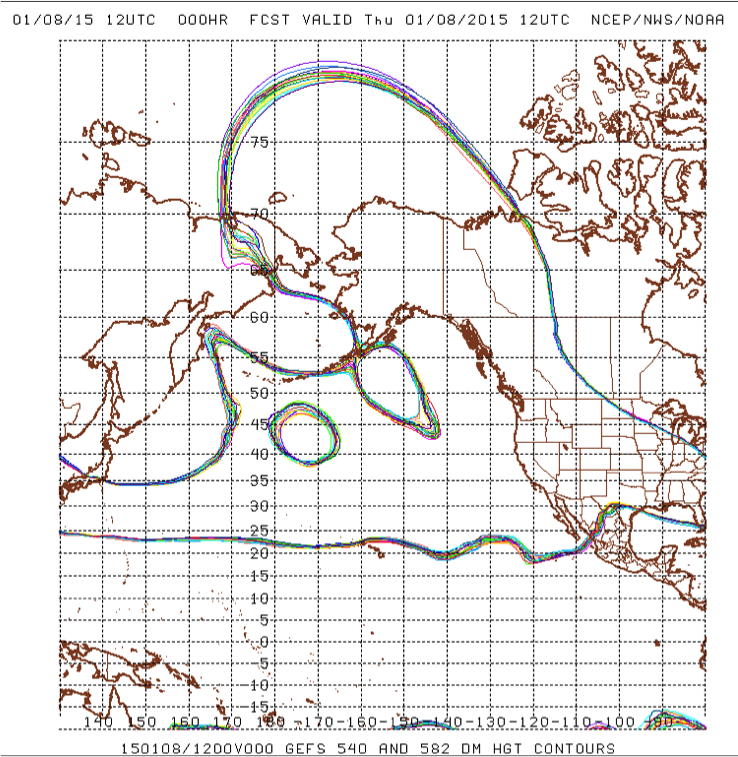 Figure 1.The 5400 and 5820 meter height contours from 20 different ensemble members over the North Pacific. The farther south (north) the height contour, the colder (warmer) it is. Current height contour locations are shown in the top image and the bottom image shows the forecasted height contour location for next Friday afternoon. Trying to nail down the exact storm track and precipitation amounts this far out is a dangerous game but the GEFS ensembles are showing surprisingly high confidence in precipitation impacting Northern California. The last few model runs have had a 50% chance of greater than a .25 inch of precip in a 6 hour period for next Saturday as can be seen in Figure 2. Figure 2. 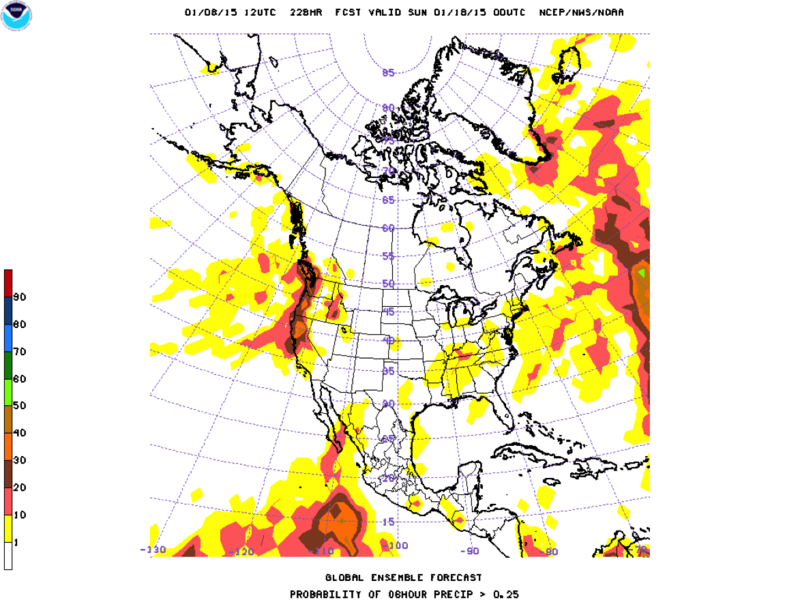 The probability of precipitation exceeding .25 inches in a 6 hour period derived from 20 ensemble members. This forecast is valid for next Saturday afternoon. It is extremely important to stress that the devil is in the details and even though the models are showing a pattern change that favors moisture reaching the Sierra, nothing is guaranteed. At this point, we can only hope that Ullr is generous and blesses us with copious amounts of moisture with this pattern change. Enough to Rinse Off the Chalk!